Shipped by weight. Cost calculated at checkout. This elegant copper plated sparkling wine chiller has a unique and sophisticated hammered finish. Designed with handles this wine bucket holds one bottle of Champagne or sparkling wine. 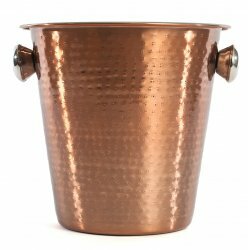 This beautiful copper wine chilling bucket is sure to stand out and dazzle your guests at your next dinner party! Bucket is designed to hold both ice and sparkling wine. Want Cheaper Delivery? The more you order, the cheaper delivery becomes!! Please check out delivery pricing for multiple of this item or combination of various accessories. If you are interested in 5 of more of this bucket, please inquiry for special delivery pricing.